IGN's Top 100 Game Developers: Games or Art? According to the leaders of the games industry games in fact are art… And I must agree! Jeroen de Bakker en Mary Hoogerbrugge over Brand Programming from MGvandenBroek on Vimeo. I am meeting Joseph Pine tomorrow to discuss his new book about the Multiverse… Should be cool! A small introduction of Mr. Iwatani, he has been working for Bandai/Namco (we always say Namco/Bandai?) 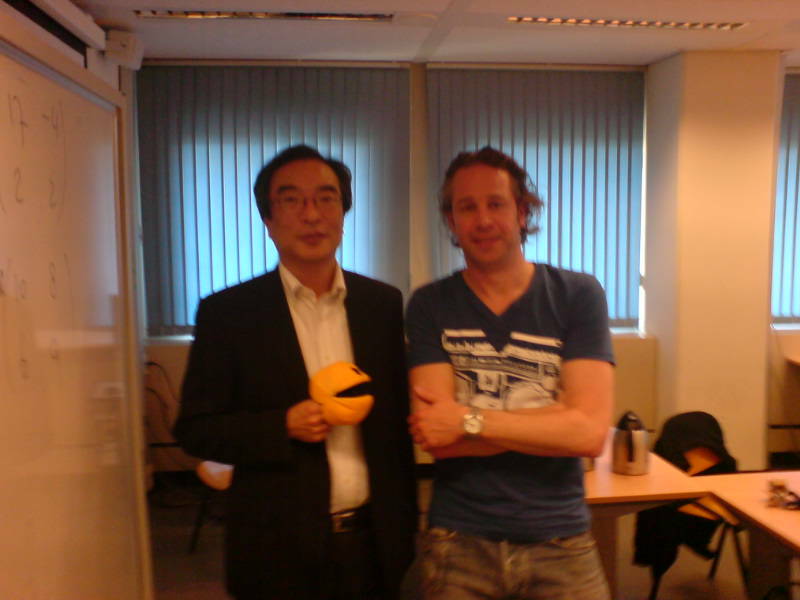 for 30 years as producer of more than 50 different games from Arcade games to Nintendo and PlayStation. He started teaching game-design at the University in 2007. A good game needs to be really, really easy to understand. The game also contains many psychological elements in one environment. The labyrinth is always easy to comprehend and not too complex. Eating the cookies (the big dots) enables the player to eat the ghosts instead of the other way around, which makes the players feel good. Being able to escape through the side-doors gives a feeling of ‘being able to escape’. And finally, when Pac-Man gets caught by the ghosts, the game will be slightly easier for a short period of time. This encourages the player after ‘failing’. It surprised me that so many psychological elements were deliberately put in the game already 30 years ago when games were just emerging. My second question was ‘what IS the Pac-Man’ character actually? Is he a moon, a pizza missing a slice or what? The answer to that question was: he is a nice – happy -guy that likes to eat. There were also variations in games where he could eat bad things like nuclear weapons. The third question I asked was how Mr. Iwatani sees games as a marketing tool and he strongly believes that games will be around us in the future like water. It will be a common way of learning and interacting with appliances around us, without even noticing that we are playing games. Games will be applicable more and more in everyday life. I was also happy that he believes that serious games are not a genre. There are just games and whether you think it’s fun or serious depends on the user and purpose. But serious purposes can be achieved in a fun-way e.g. using games…. About the future of gaming, Mr. Iwatani notices that mobile phones will be the future platforms especially when they interact with real-life, for instance in Arcade halls where you could play a game on a big iPad kind of table using your iPhone, while meeting friends and playing with them. When you leave, you should still be able to influence on critical issues within the game (keeping your character alive, defending your base, managing your resources / cutting wood, or whatever), but when you come back after a week you can benefit from the efforts and activities you undertook while away from the Arcade hall using your iPhone. I hope this all makes sense, because it is difficult to explain in plain text… I will elaborate on the future of gaming shortly! Just had a great inspiring meeting with the inventor of Pac-Man!